Writing task 1 academic process diagram. Describing a process needs specific grammar, such as the passive and sequencers for showing how something is made or processed. Below is a diagram showing how milk, cheese and butter are made for commercial sale. 1. Example of a process diagram task. 2. 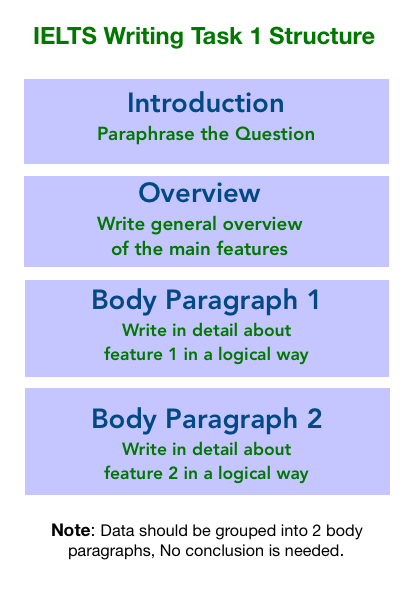 IELTS academic writing task 1 structure. 3. Grammar needed for a process diagram. 4. Example task and Model answer. 1. Example of writing task 1 process diagram. The diagram below shows the production and processing of milk and dairy products for commercial sale. 3. Grammar for IELTS writing task 1 process diagram. This type of process needs the present simple passive and active to describe what happens in each step, also we will need sequencers such as Firstly, subsequently, next, following this, after that, then, finally etc..to show this as a step by step process. Another grammar point to help link sentences is the present perfect passive. Take a look at the examples below. object + to be + past participle: This is used to describe a process where the person is not important, also the passive is used for the stages of production. The cows are milked by a milking machine twice a day. The milk is put into refrigeration storage. The milk is delivered by tanker to the dairy. Cream, cheese and butter are produced from the milk. object+verb: The active is used to describe natural processes. Cows graze in the fields. These are needed in this kind of task to help make your writing more interesting and it flows much better. In the first four stages cows graze in the fields. After that the cows are put into a milking machine twice a day. Following this, the milk is put into refrigeration storage , after which it is transferred to a tanker. The last step is the milk and dairy products are sent out to supermarkets. object + to be + past participle: We can use once and when + present perfect passive to join two processes together. Once the milk has been transferred to a tanker, it is then delivered to the dairy. As soon as the milk and dairy products have been processed and packaged, they are then sent out to supermarkets where they are then stacked onto shelves ready for purchase. Paraphrasing hint: In the question it says “The diagram below shows the production and …” this needs to be paraphrased by changing the word “shows” to “indicates” or “illustrates” the word Diagram is not paraphrased because there is no way to paraphrase that word. It will always be a diagram. In IELTS task 1 academic it is important to group the information logically as this improves overall coherence. In this case the main body paragraph one is about the first four stages and main body two is about the last four stages. I included the stage where the cows graze as that is part of the whole process. Lets look again a the task question and the process diagram and have a look at the model answer I have made. Notice the paraphrased introduction with a short overview and the use of the passive with sequencers. The diagram illustrates the way milk, cheese, cream and butter are produced, processed and packaged for sale to consumers. Overall, there are 8 stages in the process, starting with cows grazing on the grass, to the sale of dairy products in supermarkets and shops. In the first four stages, cows graze in the fields, after which they are taken to a milking machine to be milked twice a day. Following this, the milk is put into refrigeration storage. In the next step, the milk is put into a tanker where it is then ready to be delivered to the dairy on a daily basis. In the last four stages, once the milk is delivered to the dairy, it is subsequently put through a pasteurisation process. It is then turned into various dairy products such as cheese, cream and butter. Finally, as soon as the milk and dairy products have been processed and packaged, they are then sent out to supermarkets and shops where they are displayed and ready for purchase by consumers.